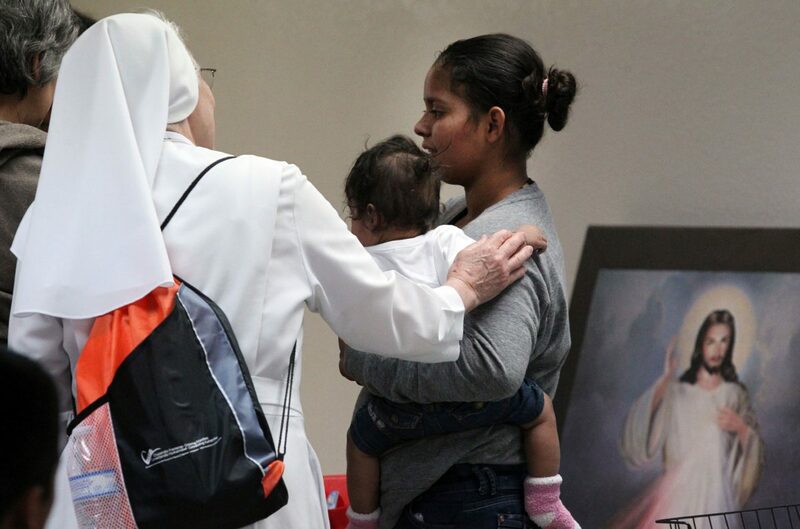 Sister Cecilia Henry talks with a young mother from Honduras during a visit to the Humanitarian Respite Center Thursday April 12, 2018, in McAllen. McALLEN — Facing threats of gang violence, Yaritza Mejia and her two young daughters fled San Pedro Sula, Honduras, in May 2017 and embarked on a yearlong journey to a place where they could start over: the United States. The family spent time at migrant shelters across Mexico but didn’t stay too long, fearing that — as migrants — they would be a target for the cartels. So on April 8, the 24-year-old single mother turned herself and her children in at the McAllen-Hidalgo-Reynosa International Bridge. By this time, 9-year-old Ashely and 5-year-old Lissy were now joined by 5-month-old Oscar, who was born late last year in Monterrey. Mejia and her children were released from a detention facility Wednesday and dropped off at McAllen’s bus station. Soon after, they found themselves at the Humanitarian Respite Center, which is operated by Catholic Charities of the Rio Grande Valley, uncertain of where to go next while they await their April 18 hearing before an immigration judge. Sister Cecilia Henry cradles 5-month-old Oscar Mejia of Honduras during his family's stop Thursday, April 12, 2018, at the Humanitarian Respite Center in McAllen. 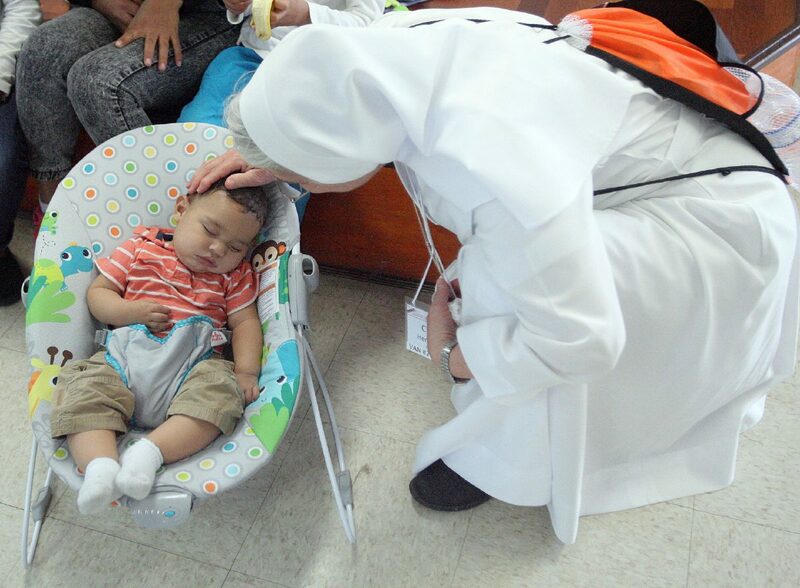 Sister Cecilia Henry gently touches a sleeping 5-month-old Oscar Mejia of Honduras during a visit to the Humanitarian Respite Center Thursday April 12, 2018, in McAllen. 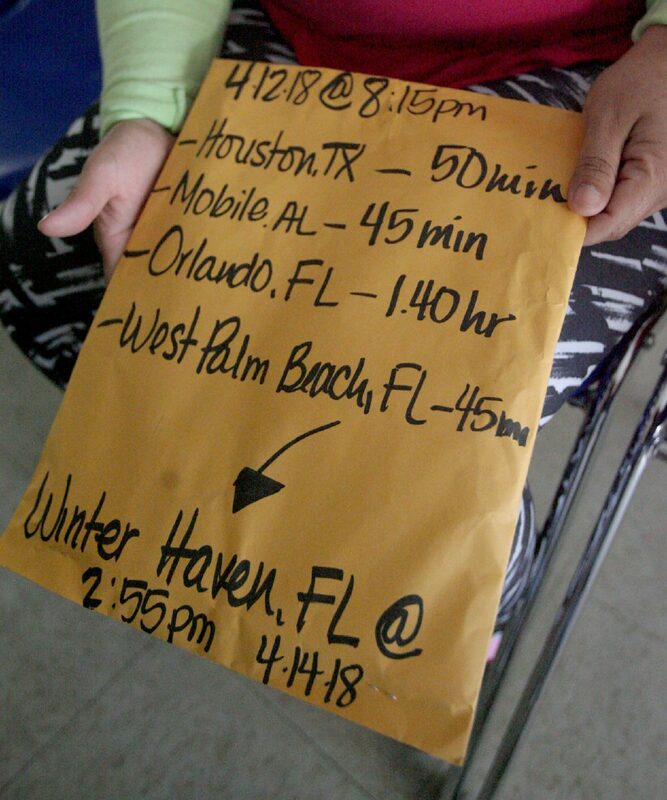 Many undocumented immigrants receive a packet with their bus itinerary for their next destination from the staff at the Humanitarian Respite Center as seen Thursday April 12, 2018, in McAllen. 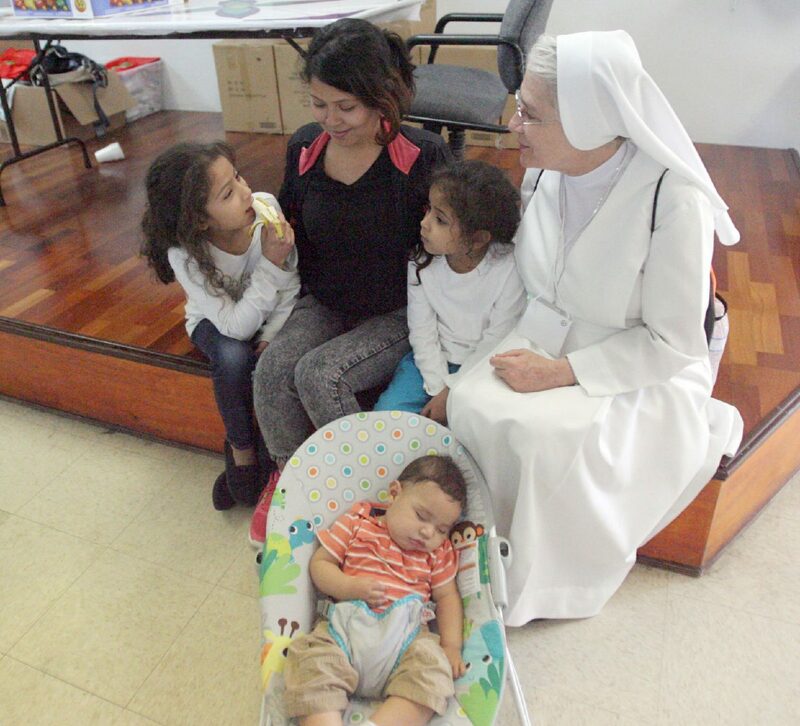 Sister Cecilia Henry sits with Yaritza Mejia, 24, of Honduras and her children, Ashely, 9; Lissy, 4; and 5-month-old Oscar during their brief stay at the Humanitarian Respite Center Thursday April 12, 2018, in McAllen. The Mejias are one of many Honduran families recently apprehended while crossing the U.S.-Mexico border. The number of Hondurans apprehended by Border Patrol increased by 66 percent from December 2017 to March of this year, according to the Washington Office on Latin America (WOLA). While apprehension numbers usually spike in the spring — giving rise to what President Donald Trump has deemed a “surge” in illegal crossings — the only real difference this year is the increase in Honduran migrants, said Adam Isacson, director of WOLA’s Defense Oversight program. Despite a 37 percent increase in apprehensions from February to March of this year, the first six months of fiscal year 2018 (which began in October) still saw 34,000 fewer apprehensions than the same time frame in the previous fiscal year. In Honduras, Mejia said her ex-boyfriend began helping the Mara Salvatrucha, or MS-13 gang, steal and resell cars, and his association made her and her daughters a target of a rival gang. But Hondurans are not just fleeing a nation where gang violence and violence against women is rampant; they are also leaving a country with widespread corruption, a stagnant economy and increasing political persecution in the wake of last November’s contested presidential election. Nydia Fernandez, 35, left Santa Bárbara, Honduras in March, taking her 10-year-old daughter and 4-year-old son with her. Her husband left earlier this year after a man began threatening him after a disagreement, she said. As the threats continued, even in her husband’s absence, Fernandez knew she had to get out — the “delincuencia,” or crime, had gotten to be too much and the local police could not be trusted. “If you want to maintain a business in Honduras, you’re going to be extorted,” she said in Spanish. She and her children crossed through Guatemala and Mexico in cars and on buses. They were eventually apprehended by Border Patrol in the early morning hours of April 8 as they attempted to cross the Rio Grande River. Conditions in Honduras were only worsened by last fall’s election, in which President Juan Orlando Hernandez narrowly won a second term in an election international observers said was marred by irregularities. In the wake of the election, 22 protesters were killed by state security forces, 60 were injured and thousands were arrested, according to the United Nations Human Rights Office. None of these deaths have been investigated by the state, Beltrán said, which “leads people to fear for their lives,” especially given that nine out of 10 homicides in the country go unsolved. And because military and state police forces have been redirected to crack down on protests — which continue to this day, albeit on a smaller level — that means there are less boots on the ground to patrol neighborhoods and curb gang violence. For now, the violence and chaos of Honduras is behind Fernandez and Mejia, and they have new concerns to focus on. Fernandez’s immediate worry was that she would miss the connections between the four buses she and her children had to take to arrive in Winter Park, Florida, where her husband settled a few months before. How would she feed her children during the three-day trip with the little money she had? Like Mejia, Fernandez also has a looming court date, which means trying to find a lawyer to help prepare an asylum application. Mejia still hadn’t purchased a bus ticket out of McAllen Wednesday. She didn’t have the money or a destination in mind and doesn’t know anyone in the United States. Houston or maybe Maryland, a state she had never been to but had heard was nice, were under consideration. Such uncertainty for Honduran families like the Mejias and Fernandezes is visible in those who remain at the respite center. 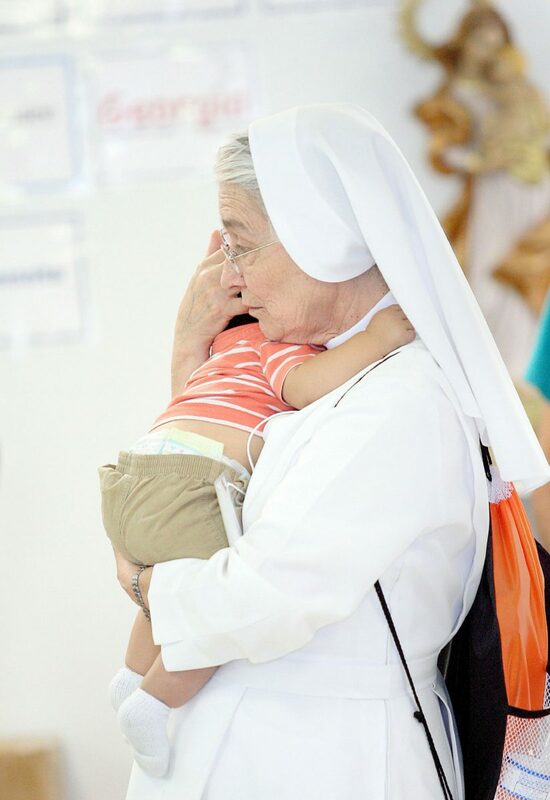 This month alone, Sister Norma Pimentel, executive director of Catholic Charities of the Rio Grande Valley, said she has seen between 60 and 100 migrants a day, the majority of whom are Honduran.